« Help desk software solutions. Support ticket systems. Decide whether a cloud-based or self-hosted solution is right for you – For smaller organizations and those on tight budgets which need a solution that works right out of the box, a cloud-based system is usually the best choice. Companies with dedicated IT support staff who can handle the implementation and management of new software and hardware will be able to freely choose between the cloud and self-hosted systems. Set a budget – The cost of a help desk varies widely and can range anywhere from $0 to well over $1,000 per agent. Set a budget and allow it to guide the purchasing decision. Be sure to pay close attention to how each solution prices its services; some services charge monthly fees, while others charge one-time-only fees. Make a list of required features – Each help desk solution offers a wide variety of features and it is vital to a company’s success to choose a solution that offers every function that is essential to running a successful support desk. Gather the support team and have a discussion about the current challenges they are facing. Be sure to ask them what they need to overcome those challenges and streamline the support process. Figure out how much storage space you need – When creating a database of articles and other support materials, it is important to choose a solution that offers more space than you think you actually need. This will ensure that the help desk is able to grow with your company. Fortunately, there are solutions that offer unlimited storage space to all of their customers. Check for compatibility – Ensure that any solution you choose displays correctly on the Internet browsers that are used at your company and by the majority of your clients. Also check that the email submission system works with your current email server. Choose the right ticket management features – All ticket management systems are not created equally. While some offer automatic ticket assignments based on rules, the ability to close and reopen tickets at will, and unlimited access to a full history of every ticket that has ever been created, others do not. Never settle for a solution that fails to provide the level of control your company needs. Always be branded – Branding your help desk is crucial to clients recognizing and trusting that their requests are reaching your company. Find a solution that allows you to easily add your logo, color schemes, and fonts to the help desk’s layout as well as to email templates. Opt for security – Dealing with support issues often requires clients and companies to exchange private and sensitive data with one another. Find a system that uses a secure connection, such as SSL and other encryption forms, for all communications and data transfers. Think about using a Web interface – Some ticketing systems allow clients to create tickets via email and a Web-based system, while others do not. Take some time to consider which submission systems will benefit your clients and company before settling on a help desk. Take a test drive – Most, if not all, help desk software companies will allow you to take a video tour of their software or use the software in demo mode for a limited period of time. Never spend a penny on any software solution until you’ve tried it or seen it in action. 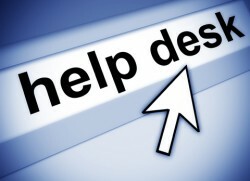 For more details about help desk software and online support ticket systems, visit www.web-based-soft.com.